The first hints of Spring are emerging and that means the decision on what to plant is coming due. While the planting decision is relevant every year, the current margin squeeze has everyone sharpening their pencils twice. The markets are also carefully watching to see just how many acres of soybeans and corn will be planted in 2015. Have prices shifted enough to favor more acres of soybeans? In an earlier post the price relationship between corn and soybeans was considered. In that post we argued that the answer would likely differ by region. This got us to thinking about how much soybean plantings had changed and where producers are more, or less, likely to make changes to soybean plantings. To consider which regions might be more likely to plant additional acres of soybeans, we started with USDA-NASS county-level planting data from 2000 to 2013. The first measure considered was the standard deviation of planted soybean acres for the given county. The standard deviation provides a measure of how much variation occurred in a county’s acres. A larger standard deviation, measured in acres, reflects more variability in the county’s planting over the time period. The second measure is the coefficient of variation. Simply put, this is the standard deviation divided by the mean or average acres for the time period. This provides a relative measure of the county’s variation of acres. Why the two measures? The standard deviation will help identify counties that have historically experienced large changes around their average plantings. The overall size of the standard deviation is important because it signals areas where larger numbers of acres appear to come in and out of soybeans. However, this measure gives a great deal of influence to counties with large geographical areas and counties that tend to plant more acres of soybeans. The coefficient of variation helps address this by reporting the standard deviation relative to the mean plantings in the county. In figure 1, the standard deviation of county-level soybean acreages is shown. Counties in red have the largest variation in planted acres with a standard deviation of 10,000 acres or more. These counties tend to geographically group together. Some of these areas are relatively new to soybean production, such as North Dakota, while the Mississippi Delta has a well-established history of ramping-up and winding-down production. Within the heart of the Corn Belt, areas of Iowa and Illinois are also likely to have large variations in the acres of soybeans planted. Across these states and the entire Corn Belt, county-level variations are not uniform and can range considerably. Several counties in the Central and North Central regions of Iowa and Illinois have standard deviations of more than 10,000 acres while other areas of the state have much lower deviations. Furthermore, Indiana, Ohio, and Missouri have very few counties with standard deviations that large. As the USDA and commodity markets estimate the number of soybean acres in 2015, the counties with large acre variations, especially in red, will be the regions that are closely watched. It is certainly true, that counties with larger total soybean plantings will tend to be more likely to show up in figure 1. In figure 2 the county-level relative variation, or coefficient of variation, for soybean acres is shown. Counties shaded in blue and red have historically experienced large changes in planted soybean acres relative to their average plantings. 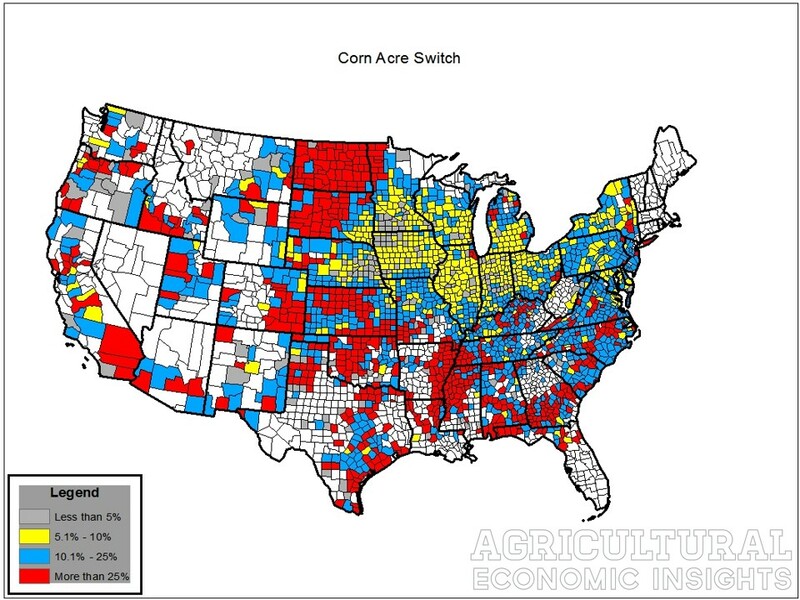 Some of these counties, for instance, might experience a 25% (or more) increase/decrease from the average acres, experiencing booms and busts periods of soybean production. The majority of counties with large relative variations are on the edges of the major soybean production area. On the periphery, changes in soybean acres will often coincide with acreage shifts in small grains on the Plains or cotton in the South. As with figure 1, even in the Corn Belt the county-level variation in soybean acres can vary greatly by state. Some counties have very low variation, with a coefficient of variation measured at less than 5%, while others report reported levels up to 25%. How producer decide what to plant in each field ultimately comes down to host of factors; commodity prices, agronomic conditions, local cash prices, and preference/experience. Each region and each county responds to the factors differently. As one examines the differences in the two figures here are a couple thoughts to consider. First, note that the overall variability relative to average plantings tends to be relatively low in the Central Corn Belt (figure 2). However, even with this lower relative variability, the acreage changes can still be large because so many acres are planted in these counties. 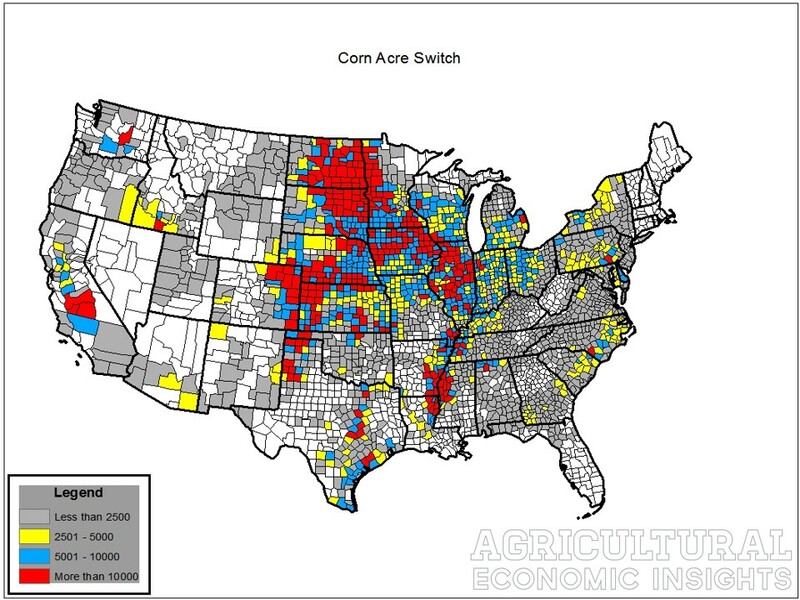 For example, see the red counties through the center of Iowa and Northern and Central Illinois in figure 1. Alternatively, there are some areas that have seen a tendency toward large relative changes like New York, Pennsylvania, Georgia, and Alabama (figure 2) whose changes tend to be less significant in terms of total acreage (figure 1). Finally, there are those through the Northern Great Plains, Kansas, and the Mississippi Delta that tend to make large changes in plantings relative to their typical plantings (figure 2) and whose overall changes are large (figure 1). These will be critical to watch in the next few months. When one looks at where the largest changes in soybean plantings have occurred several regions stand out, but particularly those in the Northern Great Plains and Mississippi Delta. Additionally, it is true that soybean plantings in the Central corn belt don’t tend to change a lot relative to overall planted acres. However, because so many acres are planted in these states small percentage changes can lead to large acreage changes. The maps for corn acre variations are available here and here.